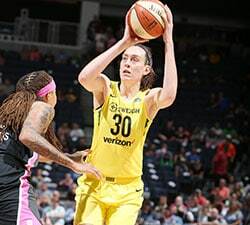 LOS ANGELES (AP) Diana Taurasi scored 19 points to break the WNBA career scoring record in the Phoenix Mercury’s 90-59 loss to the Los Angeles Sparks on Sunday. Taurasi finished with 7,494 points, passing Tina Thompson’s mark of 7,488. 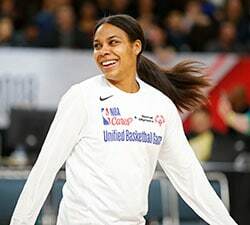 Taurasi broke the record in the closing seconds of the first half, coming around a screen by Emma Cannon near the top of the key and knifing into the lane, past Nneka Ogwumike, for a layup. The game was stopped and the crowd, which included former Lakers star Kobe Bryant, gave Taurasi a warm ovation. It only took the Mercury star 13 seasons to become the league’s top scorer. Thompson needed 17 seasons to achieve her total. Earlier in the season, Taurasi set the career 3-pointer record, passing Katie Smith. Ogwumike led the Sparks (8-3) with 18 points and had seven rebounds, and Candace Parker added 17 points, eight rebounds and six assists. The Sparks raced to a 15-0 lead, were up 22-2 and led 38-17 at the end of the first quarter. 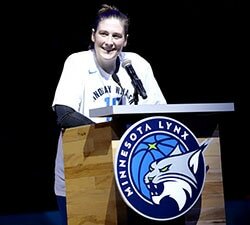 It was their highest-scoring quarter of the season and two points shy of the WNBA record for most points in a quarter. 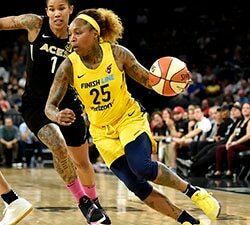 Riquna Williams hit back-to-back 3-pointers to push the lead to 30 points early in the fourth and Odyssey Sims hit two free throws to make it 90-57, the biggest lead of the season for Los Angeles. Williams finished with a season-high 15 points. The Mercury (6-5) had a season-high 19 turnovers, were held nearly 25 points below their season scoring average (83.7) and shot a season-low 32.8 percent from the field.